If you were building a railway station and most of the passengers were coming and going by foot or cycle wouldn’t you make it most convenient for these people? Not so the proposed Cambridge Science Park station. Estimated trips for the station by mode. 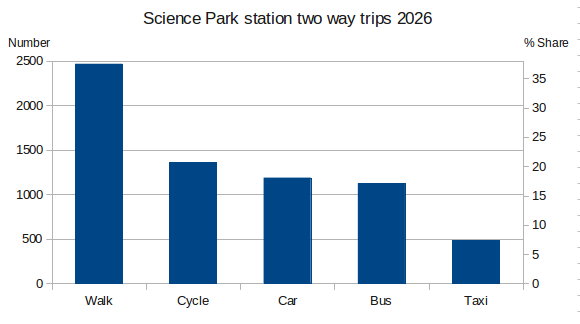 60% of trips to and from the station are estimated to be by foot or cycle, with just 1200 trips by private car. The Transport Assessment spends 31 pages on a Traffic Impact and a Junction Capacity Assessment, and “traffic” here means motor vehicles. The assessment looks at queue lengths and delays in 2016 and 2026 at seven junctions/routes. Pretty comprehensive for <20% of the trips. But then the Transport Assessment picks up pace and dismisses all other trip modes (80% of trips) in just seven pages with lots of pictures. Elsewhere the Assessment notes the complex crossing at Milton Road/Cowley Road and the delays caused to pedestrians and cyclists by the signal sequence but dismisses this as “far from significant”. This is complete rubbish. Pedestrian route when crossing from Cowley Road to the Science Park. If you are walking from the Science Park station to the, err, Science Park you will walk down Cowley Road and cross Milton Road at the huge junction at the entrance to the Science Park and Cambridge Business Park. 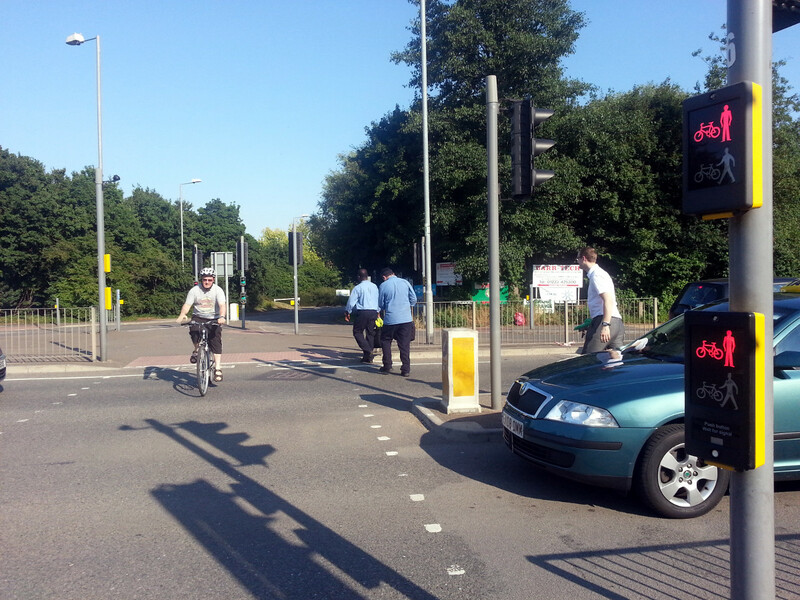 This is a three-stage crossing that apart from being very uninviting causes significant delays. 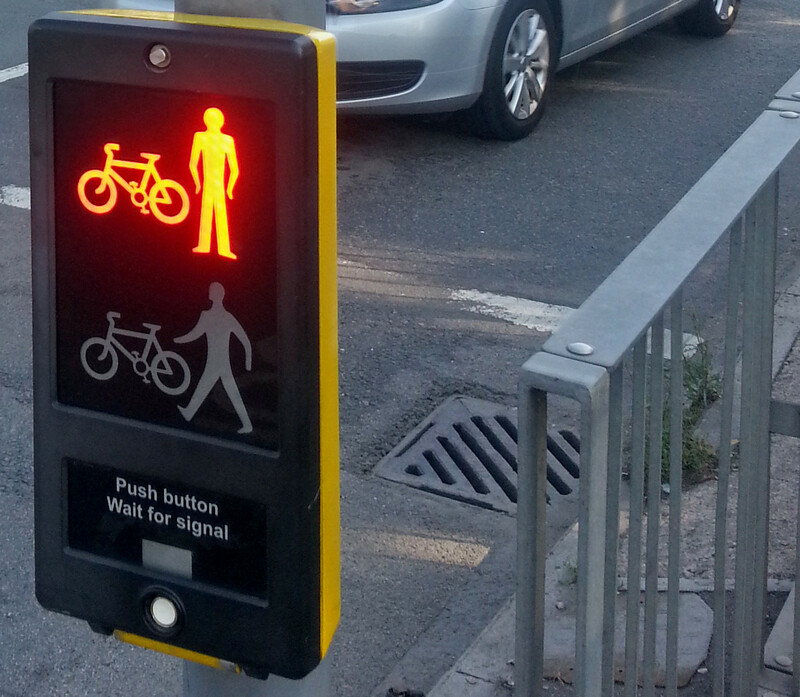 Red lights and fencing: the hostile environment for pedestrians. The cycle time of the signals is two minutes. On stage one of the crossing pedestrians have just seven seconds of green. On stage two there is nine seconds to cross and on stage three 55 seconds. However due to the phasing you have to stop part way across and so the minimum time to cross is 75 seconds. If you miss your seven second window to start crossing it could take you 188 seconds, or more than three minutes to cross the road. None of the motor traffic on major routes has to wait this long to move through the junction. It should take you only about 10 minutes to walk from the near parts of the Science Park to the station so crossing the road could add 25% to your journey time! This is very significant and not “far from significant”. Pedestrians and a cyclist cross Milton Road on red between queuing traffic because they refuse to wait for the long cycle time of the traffic signals. This also matters because if you are rushing to catch a train you will not wait at a crossing, instead you will cross on red against the traffic and potentially put your safety at risk. The station will be increasing the number of pedestrians in the area but largely ignores their needs; this is also true on several of the other routes to the station. The Transport Assessment snubs “sustainable” transport modes and instead concentrates on the minority using private cars. Will Cambridgeshire County Council amend its plans to put pedestrians and cyclists first (in line with its own policies) and make it convenient for the majority traveling to the new station?